...and I meant this as an adjective and not a verb. Evie is eating!!! ...and silently freaked out that Evie would never eat. Well, I freaked out. My husband almost never freaks out. I like to think that my freaking out/intensive planning sometimes gets this family to bigger and better places. My husband may have a differing opinion. 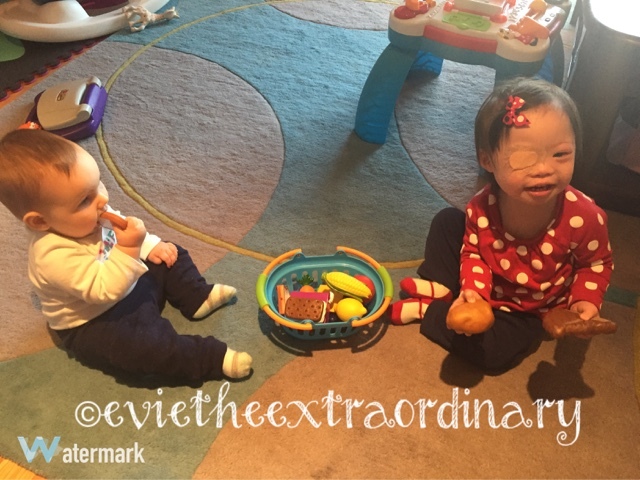 Over the past couple of months, Evie had gained enough weight for the nutritionist and GI doctor to feel comfortable weaning her off some of her formula. We reduced her formula by 20% with their blessing, and watched Evie become more amenable to opening her mouth for a spoonful of puree. We were ecstatic. When the next appointment came, we were sure that a little more hunger would make Evie eat more. We got a new plan for 30% reduction, and while I voiced concern to the doctor that a slow wean would just make her leak weight, she was convinced that because Evie wasn't eating textures other than puree, that it wasn't a good idea to reduce more than that. Sure enough, over the next 2 months, Evie ate less and less, and started to look thinner (and longer). We did a trial 4 days before her next appointment, and cut her formula by another 20 ml per gravity g-tube feed to see what she would do. In those 4 days, Evie started eating the whole pouch. She has NEVER eaten the whole pouch of puree. Now at 40% reduction, Evie is eating a whole pouch for each meal, and opens her mouth like a baby bird. Every time I see that, this mama is so happy. To be continued, but we are definitely encouraged. 1) Help the child have a fun experience with food. Evie won't put many things in her mouth, and one of the best tips we got from our feeding specialist was to buy food toys so that Evie could associate food with fun. Evie got this set and plays with it the most out of all of her toys. She loves the steak, the grapes, and the hot dog the most. Evie also likes playing with jello and water. And table knives she can grab when we're not looking. 2) G-tube parents--from all the reading I've done over the last couple years, it seems to be a theme that kids are overfed to the point of vomiting. Be prepared to trial this if you think this may be the case. 3) Learn from other parents who have done this already. I am part of a Facebook group about Hunger-based tube weaning, and the parents there have helped me so much. 4) Listen for and watch your child's cues, and be creative. Evie started associating her high chair with bad feelings, so we did away with it and fed her in a different environment. Now she eats in a different booster chair that is up at the dining room table, and evidently likes being part of the action. 5) Pay attention to what your doctor's philosophies about weaning are. It will literally affect your child's daily life and yours as well. After reading about different weaning approaches, I am a fan of hunger-based weaning. Hunger-based weaning should be done with a plan in place before starting. I wish I had listened to my instinct to cut the feed further than hanging out at 30% when I saw her eating more. She completely lost her momentum when we stopped reducing the amount. 6) Watch for wet diapers (and behavior) as a sign of hydration. Nutritionists follow a formula, but you know your child best. If someone had told me 3 years ago that I'd be blogging about wet diapers and plastic food toys, I would told them that they were crazy. This thing called parenthood is amazingly rewarding but so hard! I am thankful every day for the community of people we have met who love Evie and ask us how she is doing. You guys rock! I feel very happy and relieved for Evie. Congratulations to Evie's Mommy and Daddy!